Software last updated 7-Nov-2018 - new version 679 uploaded. Tech Tip : SMPolicyTraceAnalysis - now result in 10% of the time. Attached is a java Policy Log analysis tool that we have been using in CA Support for a while now for analysis of various SiteMinder logs. smps.log "stats" generated by regularly issuing a : "smpolicysrv -stats" command. 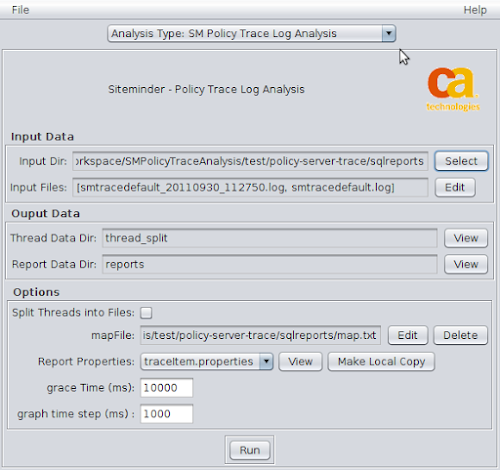 Policy Server trace logs (smtracedefault.log) files. The program is the evolution of various prior perl and python scripts into a java program which then generates graphs and PDF reports of the results. And there are many more options included in the pdf report. In general for the SMPolicyTraceTool, at least for most basic uses, how to use the program is fairly self evident. This is an internally generated tool, done by CA Support engineers and subject to the limitations of the disclaimer applied to this discussion group for uploads. A tool like this, developed on a part time basis is never complete, certainly there are bugs, limitations, and also many features we would like to add. But the tool has proved useful internally with CA Support, as it currently is and hope you find it useful as well. I am adding a link to a "beta" or experimental version, it has some good and bad additions, and is not really complete. I am adding a beta, since it has already been delayed, and it will be a while until I get back to it again. 10-Oct-2012 Added beta 298, it has some good speed and bug fixes over the beta 292 release. 20th-Oct-2012 Added beta 319, few fixes and some minor features, 31-Oct, added beta 335, bugs mainly (and removed earlier beta's, not allowed too many attachments). 6-Mar-2013 added beta 349, various fixes. 28-Feb-2014 added updated version (still beta) 2.0.0-432 various fixes, also now reads R12.51+ logs. Message was edited by: Mark O'Donohue - added latest binary version (462). Message was edited by: Mark O'Donohue Added version 485 - variety of changes and fixes. Message was edited by: Mark O'Donohue Added version 489 - variety of changes and fixes. directories based on type of thread. was throwing off the "throughput" calculation at least. completed by end of the trace, was giving -ve trans time. had made it not collect any data for this metric. when field value reported in base64 and as hex values. transactions, print fmt is same as read format. fixed - was way it inherited values from template graph. graph and table - param had wrong name. Make EnqueueAndProcessMessage the first section. of av time the policy server took to process the. are still there, just this one is now the first section. Fix NullPointer bug when SrcFile was not in input file. 20min - so good performance gain. Fixed bug where defaulted to Disk, not Memory. there are some different pattern matches. Message was edited by: Mark O'Donohue Added version 679 - minor changes to layer7 ssg log handling. SrcFile trace analysis. Also stop duplicate "long"
From a POST in Linkedin, but figured I would add the reply here as well. Generally the tool is pretty simple to run, select a directory with smtracedefault.log files, select the input log files, and then hit run. Although selecting the log files can be a bit tricky, with different name sorting conventions, and if you have gaps in the traces. Its the weekend here, and maybe I'll add a short video on Monday. Thanks for all the information Mark! Could you provide an 'ideal' smtracedefaul.txt file to be used to get a base line of our production environment? I've attached a starting trace profile that we often use, to track the basic transactions - that probably should cover most bases for a first pass through tracing performance. Thanks for the template. The analysis tool has helped set a baseline for our environment. Any other suggestions on this tool? You mentioned you created a baseline which is an excellent idea. Without the baseline, how does one know if they are having problems or not? Is your baseline from just the stats output, or are you also running profiler logs? I've done a number of things to establish a "baseline" for capacity and throughput of our production policy servers. I ran the trace analysis tool everyday for 2 weeks at 9:00am and 11:00am (our busiest times). I used the stats and profiler logs but I focused on the profiler data. The output of the trace analysis gave us a reasonable expectation for the number of authentications, authorizations, and ldap operations each policy server is doing when busy. We were also able to get an idea of throughput for each operation which doesn't seem to change by more than a millisecond or two on average. The only problem I've had with the tool is finding a place to run it. Our profiler logs are huge in prod, >1gb per 15 minutes. This makes it hard to find disk space and it takes the tool a considerable amount of time to process, though I'm not sure that can be helped. I'm running it on a Sun v890, 2 cpu, 16gb memory server. The other comment I have is that the output could use a little more description/explanation of some of the graphs generated. For example I'm not sure how to interpret 'num threads in state' and whether or not our output is "normal" or indicates a bottleneck. Thanks Jeff. I'll chat with Mark to see about making the output a little more friendly. Have anyone else used this tool? If so, what are your comments? I feel this is one of those hidden secrets that really should be shared with more people. From the graph it is pretty difficult to find race conditions, also when i run the tool for a bigger smtrace log file, the tool crashes with the below error.. Any idea ? There are some limits to what can be determined from what is in the trace log. Is there anything specifically that you are looking to find ? The "Lock Detect" feature, does graph counts where numbers of threads are all found in the same state at the same time, which gives some visibility to where, say a semaphore is keeping a number of threads on hold, or where there is a resource limit - is that the type of feature you are looking for? Also when i run the tool for a bigger smtrace log file, the tool crashes with the below error.. Any idea ? Yes, this is a bug (in my code), it comes from trying to minimize the number of open files, and for each worker thread it re-used the same file to keep the last transaction. Unfortuantly the "cleanup" before a new run has deleted all the files in the tmp directoy and the "tmp" directory as well. I think this only occurs on re-run, or re-run where you have re-selected the same directory - but an exit and restart of the program will fix it. There is also a unix related bug, where for long transactions it stores the timestep counters on disk (minimize memory usage) where it opens more than 1024 file handles, for Linux (unbuntu) at least that exceeds the defaulit file open handle, and you get an exception thrown there too. Unable to get timestamp from record, unable to parse one of [date] [timestamp] or [time] - missmatched field mapping ? I found the solution by correcting the file smtracedefault.txt . b) But if there is no header,then it will try and generate one. The original design was if no header was found, then you could manually create a map.txt file with the details. However often, in support, we are on the phone to a customer, and trying to generate a report at the same time. Being male, my multi taking ability is limited, and so I eventually added some code to generate a header. To generate a map.txt file, it reads the first 1000 or so lines in the trace log and looks for patterns in the fields to identify them, and also some special rules, like for things like PID vs TID it checks to see which ones change, that sort of thing. As it turns out it does a fairly good job, and mostly gets all of the needed fields even when you dont have the header lines. Thanks, very glad to see it be of use. I can generate the reports that I want. Is it possible to generate these stats via command line? Not yet - the gui is a layer on top of the scanning/generating code, that has been done deliberately to allow it to be cmd line driven at some time. Have you an idea how we could automate it? Eventually the plan is that it will run in a batch cmd line mode, taking the setting from a combination of some settings from a (new) property file and reading some settings from the command line. But there is no definitive date for it. Where can I find the most up to date version of the trace analysis tool? The latest one is the beta one linked to in the initial message above (I updated it a few times), it is pretty stable, and back to reasonable performance at reading trace files again. wonderful tool to get insights on what happend using the logs. we are wondering if we can use the command line tool or have an automated way of running this tool from a bash/shell script and have the results sent everyday to our inboxes via email. how far is your work on the batch cmd line mode looking?? can we expect the same some time soon.? in Unix is there a way to run the reports every day at a scheduled time(sometime in offhours) to generate the reports and have the reports emailed to us? I have found another condition where you will get a FileNotFoundException for these tmp/lastrans_***.log files. It is not the case above, but if you run on a moderately deep nested directory level then either java or Windows OS seems to have some limit for file name length. That should not be the case for NT systems - but the problem did happen on a Win7 machine. (and 256 characters may be the limit from a few google searches, but looks like it was reported and fixed as a bug, so not sure why we are getting it in win7/java 1.6). However, moving to a directory, nearer the root of the drive fixed the issue, at least for this particular case - so if you have this problem that may be worth trying. PS: The "4628795712135119537" part of the lasttrans_4628795712135119537.log above, is generated using File.createTempFile(). I've done a number of things to establish a "baseline" for capacity and throughput of our production policy servers. I ran the trace analysis tool everyday for 2 weeks at 9:00am and 11:00am (our busiest times). I used the stats and profiler logs but I focused on the profiler data. operation which doesn't seem to change by more than a millisecond or two on average. That is good to hear, and I am glad its been useful. We have tended to rely on the regular "stats" graph in the smps.log files for load comparison and to look for "spikes" in queue depth. Generally for us it has been easier to get customers to run the stats regularly since the additional output is not large and the impact is fairly minimal. In CA Support the trace analysis it more often used from a diagnostic point to view, to try and shed some light on a root cause. But having said that, in doing so we still often try to get a trace for a "normal" time to compare to the trace from a "problem" time. And I know part of Steve's motivation for getting the SMPolicyTraceTool out into the CA community site was to encourage other uses, such as what you are doing with the tool. The only problem I've had with the tool is finding a place to run it. Our profiler logs are huge in prod, >1gb per 15 minutes. This makes it hard to find disk space and it takes the tool a considerable amount of time to process, though I'm not sure that can be helped. I'm running it on a Sun v890, 2 cpu, 16gb memory server. For the memory and time taken to process however, I think I can help with that. The SMPolicyTraceTool, keeps points for each graph timestep, so memory usage tends to be related to how many points are on the graph, not on the size of the input smtracedefault.log files. Java also tends to go slower as memory get tighter parsing takes longer as java fights harder and harder to find some free memory, the default script adds -mx256m to limit memory usage to 256meg. Now the default graph timestep is 1sec (1000ms) , if you have traces over a day for example, then it is 1x60x60x24x(all graph counter) points. So for larger trace times its best to change the "graph time step (ms)" value from the default of 1sec (1000ms) to something larger say, 1min, or 10min (60000ms, or 600000ms respectively). 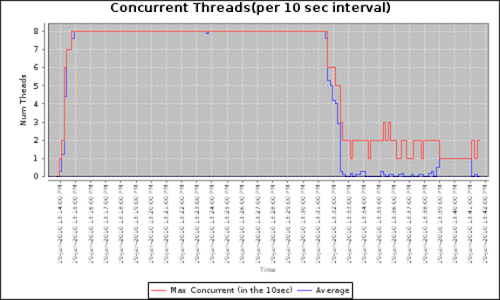 Recently we had a week of trace data, and it ran out of memory on 1sec, but worked fine with a graph step of 10min. In an ideal world, the program would suggest a good timestep based on the start end times of the trace files (and in an ideal world, it would also sort the input trace files as well, so you dont get into trouble if you mix up the input file order). But for now the graph step time can be manually set, as the "graph time step (ms)" just above the "Run" button. The other comment I have is that the output could use a little more description/explanation of some of the graphs generated. For example I'm not sure how to interpret 'num threads in state' and whether or not our output is "normal" or indicates a bottleneck. Yes, some of those are a little vague, and could do with better explanation. Some of the graphs are also a little experimental as well, and need to evolve (or perhaps be optional). I hope to add a bit more detail to the documentation in the next version. But generally for the "State" graphs and tables if you find there are some "states" where all the threads are spending time, or where many threads are in the same state at the same time, then that can be an indication of either a resource limit or bottleneck. As mentioned earlier, we have used these more in a diagnostic step, we dont have any specific data on what would be expected from a normal running system, but I can see that it could be useful to attempt to calibrate what would be expect from a normal running system. I am a new French user. I just download your tool. Thank you very much for your work, I will try to use it. Looks like the script cannot be invoked/run remotely and we have to be local admin on the server to run it. Is it possible to run the script using a CA-7 job or some other scheduler? Our policies do not allow to run anything locally as admin on policy server. Any response will be appreciated. Thanks! Yes it is possibly to run the "smpolicysrv -stats" via windows scheduler, somewhere in the doco it mentions how to set that up, with cron or windows scheduler. Windows 2008 is also a bit "special" - I have a document for that too - and will post that latter today (perhaps a note in the general section). Will wait for the Windows 2008 document. Appreciate it. I was intending to add it as a proper POST to the forum section, but it got squished out of the schedule this last two weeks. Given that, I've attached to this post a zip containing the raw rtf document that explains how to setup a scheduled task to do the policy server "stats" on Windows 2008, and one day I will pop it with a bit more explaination in the regular forumn section. PS; It's zipped, since the screenshots blew out the rtf file to 35meg when uncompressed. Did you get a chance to update the document for the windows 2008 steps? Thanks! Just got my hand on this tool and it works great for STATS logs from Policy Server and I am very pleased with it. But I have issues analyzing normal WebAgent trace files. What I did is in the WebAgentTrace.conf I add the missing required data fields needed to get more precises reports. I am really excited about getting this tool up and running. But when I loaded it on to my test server and I get the following error. I set path=%path%;"C:\Program Files\Java\jre1.5.0_14" What version java was the tool compiled in? The tool was compiled in 1.6.x java. I currently run it fine with this version in my environment: 1.6.0_05-b13. It gets generated automatically ..
Has this been tested using Time? Has this been tested using PreciseTime? Has this been tested using Time and PreciseTime? if yes to Time and PreciseTime, which one first? due to different people having a different preference between Time and PreciseTime, we have both in most configurations. further we noticed that there are some time reporting anomalies. If there is both Time and PreciseTime, it will use PreciseTime. If there is Time (and not PreciseTime) , it will give a warning, that will not be very accurate but still continue. Yes, SPS is closest for Sharepoint agent. There are a few quirks, mainly with at the log rollover times, end of last log start of new log, it does some sorting since within a log the timestamps can be slightly out of order for different threads. I also have latter version, (mainly bug fixes & ability to read newer PS log files) just waiting for approval before posting an update. PS: And there was one issue, with localization, when running on Japan local windows, and java date conversion had trouble parsing the months from DD-MMM-YYYY formats - but that is fixed now. I've updated the SMPolicyTraceTool, distribution, this one has various bug fixes applied to it, both fixes and so that it can read & process trace files from the latter versions (R12.52 Sp1+). There are some other trace files it now processes. b) The start of a cmd line version, runCmd.sh / runCmd.bat will gives parameters. This post is in response to a request for some more information about the LDAPRequestPlusWait and lDAPWait sections in the psf report from the SMPolicyTraceAnalysis tool. Quite some time ago now I added two additional sections LDAPPlusWait and LDAPWait in addition to the graph for LDAPBank to the pdf report. What was the problem - why did we need another graph? We were not showing bottlenecks in the LDAP Request clearly enough. The LDAP responses of 2.5ms seem pretty good, but that was not the entire picture, and in this case the LDAPBank was the performance bottleneck - but it was not visible on the LDAPResponse time graph, as all the LDAP Responses looked very good. Now we can see that for this thread, the LDAP request might have only taken 2.5ms, but the thread spend 131.5ms doing something else prior to executing the LDAP query which then took only 2.5ms. That delay or LDAPWait as I've termed it is not visible in the original graph of the LDAPResponse times. What is the root cause of large LDAPWait problem? In the example above there were 50 policy server worker threads, only one LDAPBank, and the customer was running a stress load test. The root of the problem is with one LDAPBank. Each LDAPBank creates three physical connections to the LDAP server, all three are used for different purpose, and only one LDAP connection is dedicated to LDAP queries. So with one LDAPBank we can only run one LDAP query at a time, and while that query is running if any other threads that also want to make an LDAP call have to wait until the previous LDAP command is finished. So if we have 50 threads all wanting to run LDAP queries, then the 50th thread would wait 2.5ms * 49 = 122.5ms until the LDAP connection is available, and then would run its own LDAP query in 2.5ms. Also the LDAP response time is very quick, but that is because we are only running one LDAP query at a time, and the LDAP server is running low CPU. But Av ProcessRequest time is long. So this delay or wait for a LDAPBank to become available is the root cause of the problem. How do we calculate the LDAPWait time in the tool? Normally in SMPolicyTraceAnalysisTool, I rely on a pattern match for a "start condition" and a pattern for "end condition", to calculate a time. In Siteminder they are usually an "Enter function ..." and "Leave function ..." message pair. The LDAPRequest time graph is one of the special ones that parses the [Message] line to get a transaction time. But calculating this wait time was a bit more challenging, since for the LDAPRequest, there is not a regular previous message that indicates the start of thread requesting an LDAP search. LDAPResponse as the time of the LDAPRequest , as per the split timer and returned in the [Message] field. LDAPWaitTime is the difference, a high value here usually means your bottleneck is you do not have enough LDAPBanks and requests are slow because they are waiting before they can send their LDAP query. 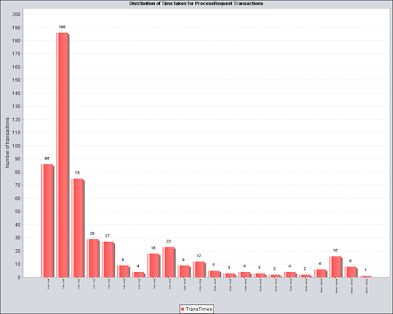 And then graph those as sections in the generated pdf report. If there are delays in accessing the LDAPBank then the LDAPWaitTime graph should show that. What is the solution for cause of large LDAPWait problem? In the LDAP user store configuration screen it is common for (first time users) to specify a single LDAPBank, or a small number in load balance and failover mode. But for optimal performance a "single" LDAPBank, is one connection, whereas what we really want for good response, is a "pool" of LDAP connections. So obviously if you have 50 worker threads, and 1 LDAPBank, then under load and with moderate LDAP response time that single LDAPBank can easily be your load bottleneck. Hopefully that explains the origins of these two extra sections in the pdf report. Having been involved in quite a number of load testing and optimization cases by now. The optimal setup for best throughput seems to be when the number of LDAPBanks (our pool of LDAP connections) approaches the same size as the number of policy server worker threads. There is an upper limit of number of LDAPBanks, which is around 64. There seems to be more involved than just the sequential time waiting for the LDAP response, and with higher numbers of worker threads there seems to be also some delay navigating the locks that surround the LDAPBank. When the LDAPBank pool size is close to the active worker thread pool size, that lock time seems to be minimized as well. But if you are having performance issues, and you have a single or two or three LDAPBanks, then I'd recommend try doubling them to two, or four or six, run your load test and see if you get better performance. Then keep going until you reach your throughput target or until you do not get better performance. Just one note on the hosts file. At least in 12.52 SP1 you cannot seem to use the hosts file for the AD namespace user directory with SSL-enabled (secure connection option checked). It'll work for "LDAP" user directory SSL connections, but if you use incorrect hostname causing certificate mismatch to the AD one it fails when using the 'secure connection' option. Discovered this while going to implement this type of setup here. Last edited 1-Aug-2016 - new version 490 uploaded. The one new addition is that when you choose split-threads option, to split the smtracedefault.log into separate file for each thread after processing it will put the threads into different sub directories depending on function. I set up a cron job to run smpolicysrv -stats every 5 minutes but it won't pick up the thread stats. I am using SMPolicyTraceAnalysis-2_0_0-BETA-491. I tried a few older builds but it's the same. Thanks for the kind words, for the stats print and the threads. The original policy servers used to output, Current and Max threads, where "Current" was activity running threads. Somewhere about PS R12.51 start of R12.52 that was changed to allocate all worker threads at startup, and then "Current" always equaled "Max" and was not particularly useful. With three values printed, but the "Busy" one having the most meaning. And as soon as you fix one problem, that of course causes another. Some optimization, the tool would check for each smtrace input line and run that line through all of the metrics, to ensure the <timestamp> was current and at the latest point for each metric. This was reduced to try and call some of those if the counter is not found, only to call when skipping to the next graph interval, rather than for every input line. A side effect was the AvTransTimeOverTime (which graphs the av & max times for transactions that finished in the last 5 sec), was then not collected - should be fixed now. I didn't look up the defintions of the new items, but assume they are an av value since the last plot time. So av response time, av queue wait time, and av throughput since the last Statistics command was issued - will confirm that when I get a chance. Thanks a lot Mark for sharing this. is there any possibility to add functionality to do analysis on smaccess logs in future version of this tool? Hi Vikash, (sorry took a while to reply) but that is a good idea, unfortunately there are a lot of good ideas and only limited time. In particular: it would be good to follow transaction from agent to policy server via logs, to be able to load the counters into a database, and give better control over what graphs to print; and to be able to load traces from multiple servers into a database and print graphs showing multiple policy servers and a few other things. But analysis of the access log would be handy and not too hard to implement, so I expect that will happen at some stage. I see IDM Log analysis option in the tool, do you expect this to be working ? are you planning to enhance this option ? Hi Ashok, From memory, I think as it currently reports and graphs line count, and # of errors, warnings, info per timestamp. I had trouble becasue there was not a good "start of transaction" and "end of transaction" tags for requests in the logs, so I could not report or graph a "transaction time". I was looking at some of the IDM reports that were taking too long at the time. If you have something that would be good to count, or where I can match a start/end transaction I can include it fairly easily. Thank You Mark for your response. Let me see how I can contribute to this enhancement. This tool really helps many people in the community who is working on SiteMinder products. I could see the option for the Arcot Trace flow analysis as well, When i was using the "arcotafm.log" for trace analysis i see blank report pdf being generated. when i checked the report template that automatically populates on the GUI it has arcotAFMtraceitems.properties which lists the parameters about what report needs to be generated, however i couldn't modify that because of no document available. Could this be modified? or if you have documented what report to be generated that would help for the Arcot Customers to get the reports. I also had idea to make it modular so that all one would need would be an inherited class that would read the trace file split it into fields, and a properties nominating values of fields that indicated start and end transactions. Those were my first attempt, at match start and end transactions - but it is not complete. As you can see with the _1 and _2 you can have multiple patterns for start and end of a transaction. group 5 could be split into category (class) and I guess the 53 is line # - maybe? What it needs is definitive list of Patterns in the "Message" part that starts a request, and end a request. You can either replace it youself in the .jar file, or send it to me and I'll post you a fixed one for you to test. Thanks for the reply. I will check on that will find better parameters and update here.